It’s been an incredible year here at Conceptual Academy. I’m not sure where to begin, except to say thank you for all your support and inspiration. I’m excited to announce we just finished updating all our courses for the 2017-2018 academic year. In addition to a new batch of video lessons for each course, this also includes more Practice Page worksheets, Next-Time Questions, as well as revised comments from us on each FYI page (From Your Instructor). For those of you who don’t know, an FYI page is where we offer our detailed study advice to the student for each lesson. You’ll also now find embedded PhET simulations within many of the FYI pages. These are a definite student favorite. . .and they’re a great learning tool too! Notably, our integrated science courses are now fully developed, except for still being a bit shy on the biology video lesson. But we’re still working on that and have provided some key resources to make up for this. In that spirit, we also collated labs from our own lab manuals and embedded them within each of our courses. Which labs? The ones that are not only our favorite but that can be accomplished using household materials. So with this 2017-2018 update, we’ve got you covered when it comes to labs. A few caveats: We included many of these labs within our chemistry courses. But for our chemistry courses, we still recommend the eScience Lab kits. For our Conceptual Physics course, you will be able to download all of Stephanie’s physics labs right from this website, LearnScience.Academy. Soon to be posted (as of this writing) her physics labs will be a free download. But I insisted to Stephanie that she provide homeschools the option of “paying it forward” with a requested contribution of $15 for each download. On a side note: Stephanie is also a biologist! We’re looking forward to Stephanie’s biology video tutorials, which we’ll be posting as fast as she and her daughter (a multimedia producer) can crank them out over the next year and beyond. Thank you Stephanie!! And from all of your feedback, I came to realize the importance of creating a users manual for each course. You’ll find this manual posted for each course here at LSA, as well as in the first FYI page within your Conceptual Academy course. Each manual, for example, will tell you exactly how the labs are set up for that course. The manual will also address any questions you might have about what a typical week might look like and how to grade your student’s work. We also dig into our teaching philosophies. Concurrent to all this development with our homeschool self-study courses, we’re also making some great progress with colleges. Last year at this time we had about eight campuses on board. For this coming fall semester we have twenty!! Behind this remarkable growth is a growing recognition of the value of “active learning” at the college level. This is what Conceptual Academy does for the college instructor: Students can go home for their lectures (at CA) and come to class to study under the expert guidance of the course instructor. Gone are the days when all the instructor does in class is lecture, lecture, lecture. Actually, that’s a bit of fantasy there. We find that many of college instructors, especially in science, are still holding to the 20th century lecture-only model. Our mission is to change that. To show them what is possible. And to provide them the tools so they are empowered to actually move in this direction. We understand that within a home school environment, your students have such key advantages. Yours are students who are ready to rock n roll truly helping to make this world a better place. But of course there are many students like this in public and private schools too. Imagine the heartbreak of such students heading to a college where they are piled together into a large auditorium merely to listen to knowledgeable professor pontificate. Never to take advantage of the fact that they could be working in class with their classmates under the direction of the instructor on problem-solving, hands-on activities, and articulating that which they think they understand. . .like the ultimate study session. This is what we support here at Conceptual Academy. We are excited to see such growth over the past year. But we know we still have a long ways to go. By the time your student heads to the college of their choice, our hope of hopes is they’ll be able to find a campus where active learning in the classroom is the number one criterion placed upon the instructor for promotion or tenure. Our education system deserves no less. I found myself teaching at Texas Tech in Lubbock, TX, last fall semester, 2016. Those are my students in the above photo. Notice they’re not listening to me, but interacting with each other. 🙂 What an experience that was. I had some 300 students. 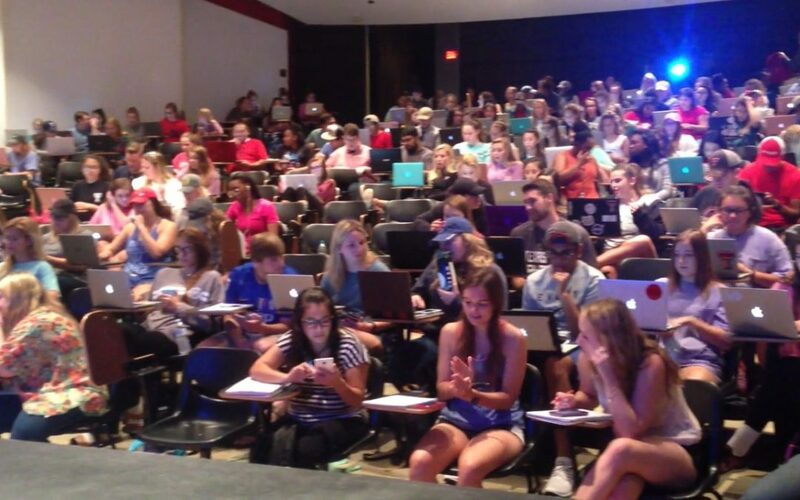 Imagine active learning in a classroom of 300! It was intense work, but we had a blast and much was learned by all, myself included. I’m still getting emails of appreciation from those super friendly students of West Texas. Wow! As a traveling instructor, this coming fall semester (2017) I’ll be teaching a class of “only” 150 students at Weber State in Ogden, UT. I’m chomping at the bit to apply all the teaching techniques we developed down at TT for a class only half the size. How is it that I teach at different campuses? These are campuses where our textbooks are used. It’s an honor to accept their invitations. What I learn from each campus helps us in crafting our curriculum. It’s also a prime opportunity to “show” a department what active learning can look like for their particular students, rather than just telling them about it. Really, it’s so much easier to simply lecture. Active learning can be a tough sell for a department, but once they see the results, there’s no looking back. So let me end this blog the way I started it: with a big thank you. Thank you for all your support. Please let us know how your Conceptual Academy course is working for you. Your feedback is key to helping to keep our curriculum top notch, which is exactly what every student deserves.